Theft – On July 01, 2015 at 3:39pm Patrolman Adam O’Connor was dispatched to the water tower located on Locker Street and Seaman Ave for a theft report. Upon his arrival a worker for Sprint Wireless stated that copper wire was stolen from the site. The worker advised that the copper wire was cut and removed from the location sometime between June 20th and July 01st . Detective Daniel Altman has been assigned to follow up. Fire – On July 01, 2015 at 6:10pm, Patrolman Keith Meissner responded to a residence on the 600 block of Bayside Avenue for an oven fire. There was no active fire at the time of the officers arrival. The Beachwood Fire Company responded and checked the residence. 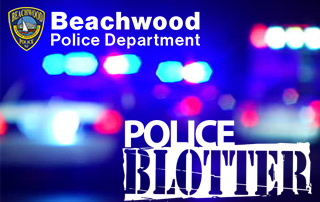 Criminal Mischief – On July 02, 2015 at 10:20 am, Lieutenant DeMarco responded to the beach area and met personnel from the Beachwood Public Works Department who advised that two electrical outlet covers were damaged. The damage located on the dock, occurred sometime between June 29th and July 1st . Fire – On July 02, 2015 at 11:25pm, Officer David Bowden and Sergeant Derek Mussari responded to the 800 block of Spar Avenue for a report of wires down. It was discovered that a tree branch had come in contact with the wires causing the damage. Beachwood Fire Company responded to secure the area and JCP&L were notified. Fire – On July 04, 2015 at 12:14 pm, Patrolman Sean Langan responded to the area of Bowline Street and Anchor Avenue for a transformer fire. Beachwood Fire Company responded and confirmed that there was no active fire at the time and notification was made to JCP&L for follow up. MV Accident – On July 04, 2015 at 10:17pm, Patrolman David Bowden and Sgt. Frank Melillo responded to a motor vehicle accident involving two cars at the intersection of Route 9 and Longboat Avenue. One driver sustained minor injuries due to the accident. The accident did cause traffic congestion which added to the normal holiday traffic on July 4th. Fireworks Complaint – On July 06, 2015 at 8:43pm, Officer Gina Bruno took a report from a resident on Chestnut Street after firecrackers were placed in the mailbox and set off. There appeared to be no damage to the mailbox at the time of the report. Theft – On July 10, 2015 at 10:08am, Patrolman Justin Apel was dispatched to a residence on the 200 block of Admiral Avenue for a theft report. The owner of the property reported that a washer/dryer, chain saw, ladder and other various tools were taken from the residence. The owner did advise the officer that the property is a rental property and the theft may involve previous tenants. The property taken was valued at approximately $1400.00. Theft – On July 11, 2015 at 9:14pm, Officer Gina Bruno responded to an address on the 200 block of Beachwood Blvd. for a theft report. Upon arrival the officer was advised by the resident that their car was stolen. Further investigation by the officer revealed that the resident knew the individual, alleged to have taken the car, and was unable to contact the individual. The resident stated they did not consent to the use of their vehicle on this specific occasion. The vehicle was listed as taken without consent and later that night located in Lakewood. Criminal Mischief – On July 12, 2015 at 11:00am, Patrolman Thomas Prince was dispatched to a residence on Chestnut Street for a criminal mischief report. The resident reported that sometime during the overnight hours someone damaged their mailbox. Fraud – On July 12, 2015 at 12:25pm, Patrolman Thomas Prince took a report from a resident on Nautilus Street after the resident noticed fraudulent charges/activity on a bank account. The issue appeared to have occurred online and has been assigned to the detective bureau for follow up. Theft – On July 12, 2015 at 10:00am, Patrolman Justin Apel and Officer Thomas Prince were dispatched to a residence on Nautilus Street for a theft from a vehicle report. The resident reported that a wallet was stolen from an unlocked vehicle sometime after 10:30pm on July 11th and 8:30am on July 12th. Detective Adam Griesemer has been assigned to follow up.